Still using old corkscrew to pull and twist before enjoy your perfect wine? 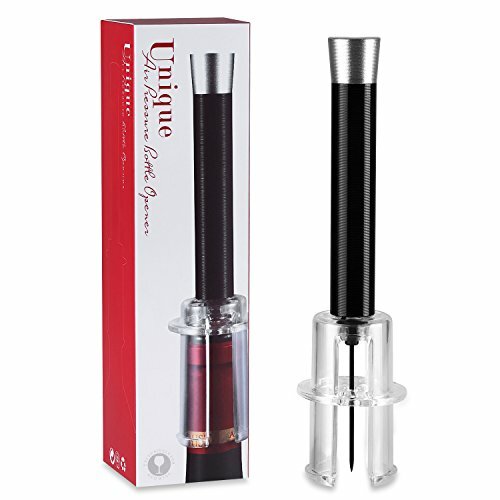 Here we present you the Revolutionary OG-EVKIN Air Pump Wine Opener. One right size to fit all bottle. SIMPLE AIR PUMP WINE OPENER: Such a simple, easy and fast way to open. Just slide the needle in, pump a few times and then the cork is out. NO MORE PULLING OR TWISTING: More efficient and convenience. Easy to use without hassle of pulling, twisting or broken cork pieces. ELEGENT GIFT BOX PACKAGE FOR YOU: Perfect gift ideas for your families, friends, loves and colleagues. Great for bar, cafe, restaurant or home use.